Showers will develop Saturday night into Sunday and continue into Monday. Snow level will likely be 8k feet or higher. A few inches of dense snow way up high will be possible. Unfortunately, these showers could put a damper on closing day festivities at a few local resorts. We clear out by Tuesday with warming temps once again for most of next week. Showers are possible again next weekend. First of all, a big THANK YOU to all of you who have followed along and read the forecasts this season. Last year, I felt like the bearer of bad news day after day. This year, it was so much fun to share what seemed to be a constant stream of good news. I love forecasting seasons like this! I appreciate your passion and enthusiasm for snow and snow sports, as well as the eagerness to learn about Utah winter weather. It didn't seem to happen much this year, but I always appreciate the patience and understanding when the forecast doesn't workout as expected or when the storms aren't arriving as frequently as we'd like. So thank you, it means a lot to me that you enjoy these forecasts! Unfortunately, it's that time of year when we have to wrap things up. I will be updating the forecast section above every few days for as long as there is snow in the forecast, but as far as detailed forecasts are concerned, I'm done for the season -- and what a season it was! We then had a week or so of high pressure to close out the month of January. As it turns out, that would be our longest stretch without precipitation for the rest of the winter season as the hose turned on in February and didn't turn off again until mid-April. No matter how you slice it, statistically this was a good year. I wanted to compare the numbers to that of previous years and see how it stacks up. 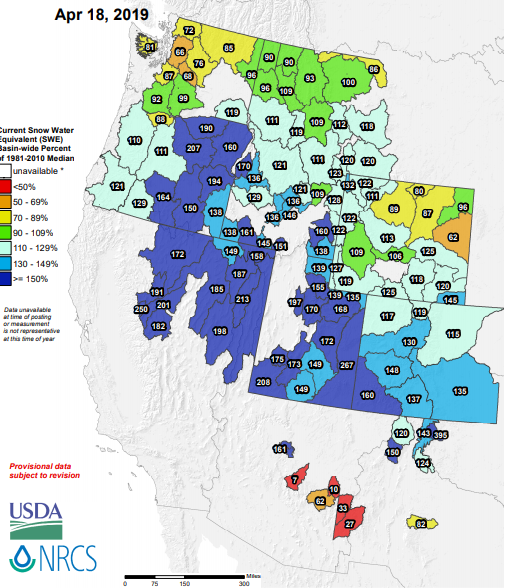 The above graph is an average of 96 snowpack gauges statewide that make up the NRCS network. I have added labels so you can see some previous years. The bottom line (grey) is last year. 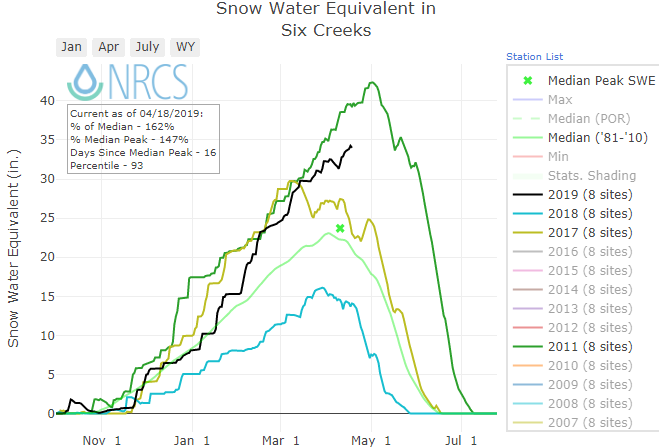 As you can see, it was not a good year with the mean snowpack peaking at just over 10" of SWE. By contrast, this year (black) we have peaked at mean of more than 22" of SWE, more than double the water of last year. 2016-17 was another great year. You can see that we trailed that season for much of the year. 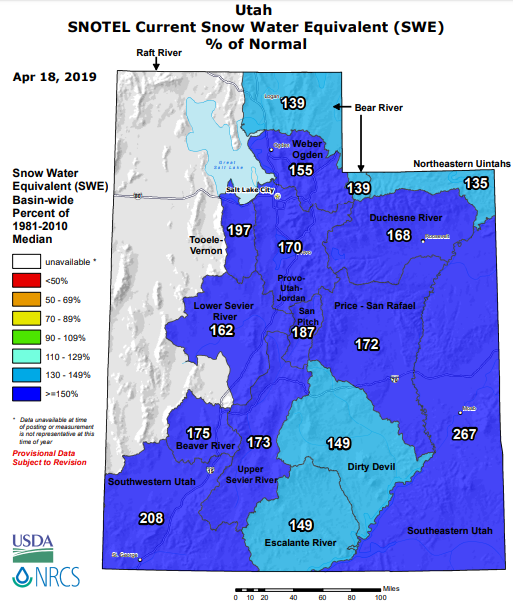 However March 2017 was dry and very warm, so the average snowpack peaked more than a month earlier than this year. This year, we continued to see cool, wet weather and we have now surpassed the peak from 2017. I also added in the gold stand in Utah snow years -- 2010-11. If you were around, you may remember a season where we saw storm after storm seemingly all the way until June. This year, we will come up short of 2011, but we really aren't that far off. 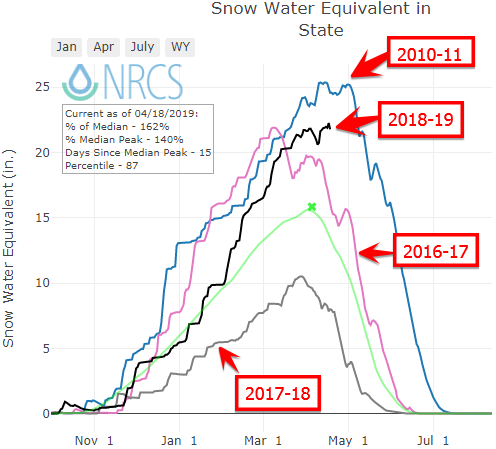 Since 1981, there's really only been 2 or 3 season that you can definitively say are better than this year from a statewide snowpack standpoint. 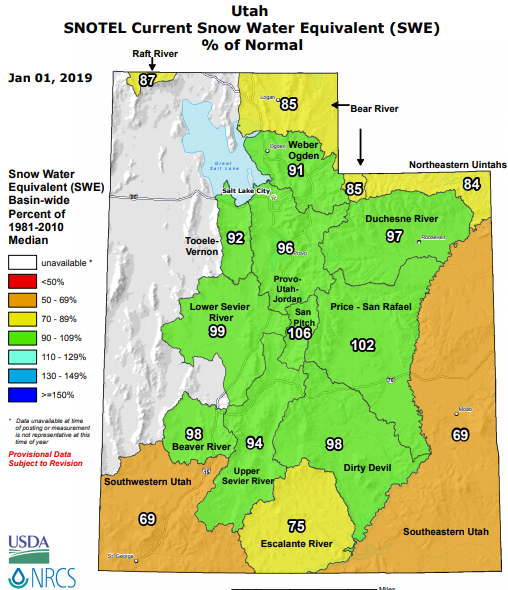 Since most of Utah's skiers are concentrated in the Central Wasatch (PC/Cottonwoods), I also pulled the Six Creeks average snowpack numbers which includes locations such as Snowbird, Brighton, Mill-D, Thaynes Canyon and Parley's. We see a similar story to the statewide average. We are significantly above 2017, more than double last year, but still trailing 2011. Snowbird's high elevation made it more immune to the warm storms and spring temps in 2017. 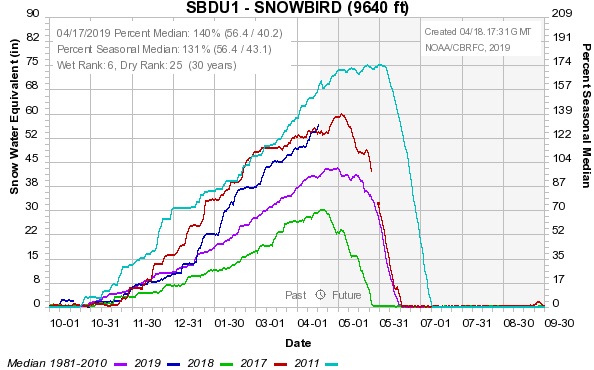 So unlike the prior graphs, Snowbird did not lose snowpack in March of 2017. Therefore, we only just passed 2017 in snowpack. However, 2017 had a stormy end of April, so there's a chance 2017 could pass us again. 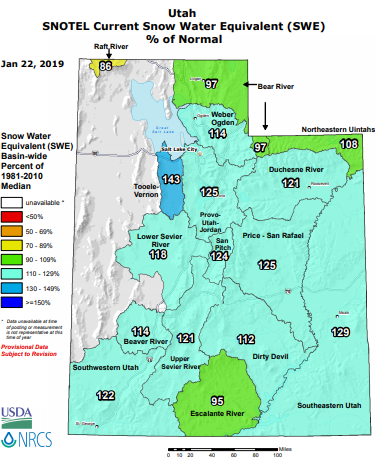 Snowbird's snowpack is 140% of median and almost double the snowpack on the same date last year. We should easily have enough snow for Snowbird to stay open into early June and perhaps later. What made this season great from a weather/climatological perspective? Good question. This year was kinda vanilla. It was a weak El Nino, but the MJO wasn't overly active. The PNA didn't seem to be too much of a factor. Often, we can get persistently negative PNA oscillations but we didn't have that this season. Much of this is beyond my level of expertise, but I think sometimes you can just get lucky, and we seemed to just get lucky this year with frequent storms that tended to overproduce. What do you think of this season? How does it rank on your list of best Utah seasons in terms of quantity and quality of the snow? I'm curious to know your perspective!